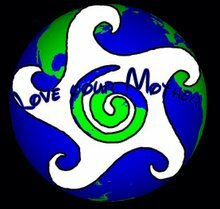 When a 20-something woman began running down Barefoot Beach I took notice. In front of her was a flock of 25-30 Royal Terns and assorted gulls and her intent was obvious - get every single bird to fly. As bird after bird took off to avoid the rampaging woman in a sun dress, Ma-Le suggested that we (including my sister Tara and family) get up and rampage toward the woman. I would have done it if I wasn't tired, comfortable, lazy and just too embarrassed to perform this display of karmic balance. I wish I had - I was annoyed - the woman not only disrupted our peaceful setting but when birds are disturbed like this they waste energy. One person doing this might not impact them much but repeated disruptions? The woman and friends passed. The birds settled back down and relaxed and than my nephew decided to go for a stroll of his own. The screaming never stops on the bird rookery. Babies want food. Mates need help. Competitors jockey for better territories and struggle to secure mates. It's so noisy here on this island in the middle of the Caloosahatchee I almost forget the foul smell of fish and bird poop. During the breeding season, many birds develop special plumes or bright colorations to attract a mate (the teal blue eye of the Anhinga, the crimson legs of the White Ibis). The Great Egret has spectacular tail feathers called aigrettes that were once prized by plumage hunters. They appear wispy and delicate and have a yellowed - burnt marshmallow appearance towards there tips. In the late 19th and early part of the 20th century, plumage hunters sought out rookeries where they would slaughter nesting birds and take their feathers. Chicks were left to starve. Eggs left unincubated never hatched. The feathers were used for decoration and specifically for women's hats that were all the rage at the time. In 1908 - an ounce of plumes was worth more than an ounce of gold. Great Blue Herons, Flamingos, Roseate Spoonbills, Wood Storks, Egrets and other bird populations were severely impacted by this less than noble trade. When the plume rage was exposed as murderous fashion, the rage of the nation led to federal legislation banning the sale of plumes. Populations have been slow to rebound over the many decades that have passed and some say for every Great Egret you see today - you might have seen 10 a century ago. Here at the rookery, Wood Stork nests far outnumber Great Egret nests. Nevertheless, courtship continues as Egrets flash their aigrettes like a Peacock (since the courtship period is over - I don't have a shot of this). Mates are wooed. Eggs are laid. Chicks are born. Here -one of several chicks pesters an adult for partially digested fish. We can be thankfull in large part to the Audubon Society who led the way in protecting South Florida's birds well over 100 years ago by introducing protective legislation, developing educational programs and putting boots on the ground to physically protect the birds - assuring that we wouldn't have to live without aigrettes. If the Stork is said to bring babies - the Wood Stork brings the ugly babies. I had a great opportunity to float up the Caloosahatchee and check on a bird rookery on an island in the middle of the river. There are an estimated 10,000 nesting pairs of endangered Wood Storks in all of Florida with at least 50 nests on this tiny mangrove island. Presumably raccoons and other nest predators can not swim out this far, making this an ideal location for not only Wood Storks, but Great Egrets, Snowy Egrets, Anhingas, Great Blue Herons and Black-crowned Night Herons (more on them later). Standing nearly 4 feet tall with a wingspan over 5 feet, this huge wading bird uses its massive beak to probe for fish, crustaceans, insects and even baby gators in the shallow waters in and around the Everglades and other Florida wetlands. When the water levels are right - Wood Storks nest, but during droughts when water is absent and little prey is available they will not nest or abandon nests if they can't collect 400+ lbs of fish for themselves and their young during the nesting season. (I have yet to see the scales they use to weigh their food...) If the water level is too high and prey species can easily disperse - feeding is again complicated and nesting may not occur. Their bald heads and long beaks may not win them any bird beauty pageants but in flight they are gorgeous. I'm using a Canon 40D with a 300mm zoom which allows me to see details that I hadn't noticed before. Check out the peach-colored band on the underside of the wing feathers. I had thought in the past it was simply sunlight coming through the wing. Not so! The nests are made of twigs and branches. They lay 3-4 eggs which hatch in about a month. They fledge (leave the nest) in about 2 months. 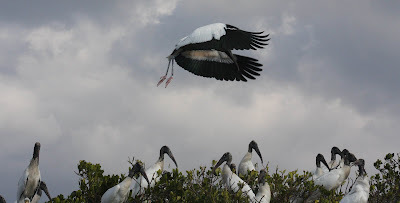 The drought and human manipulation of the water cycle here in Florida has caused some of the Wood Stork populations to shift breeding to earlier in the season when food is plentiful. Birds at the Corkscrew Swamp were nesting in November while these birds should wrap up nesting in a few weeks. Based on birds flying in from the Northeast - we think they are foraging in the Babcock Wilderness Area a few miles away. While Wood Storks may bring ugly human babies to unsuspecting parents, there is no doubt that their downy white babies are quite adorable. Give them a few months. They'll be bald and goofy looking too. 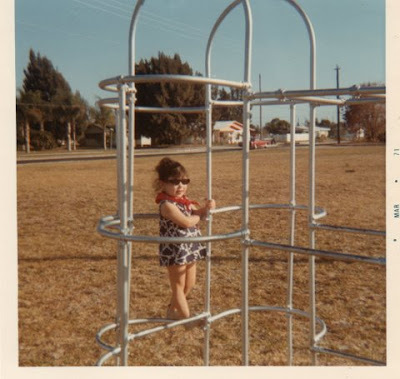 The following is a continuation of Tiffany's flashback tour of Venice, Florida where we grew up. Here are some of her photos from way back when and from now. 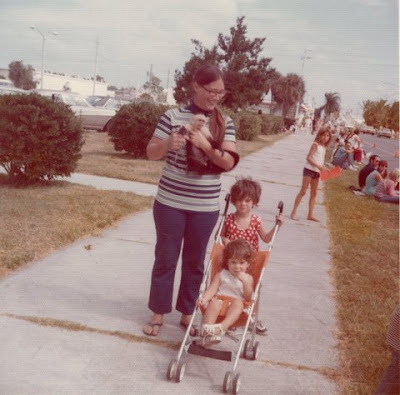 Venice Avenue 1973 - Mom, a monkey, me (with hair) and little sister Tara in the stroller - she kinda looks like another monkey. 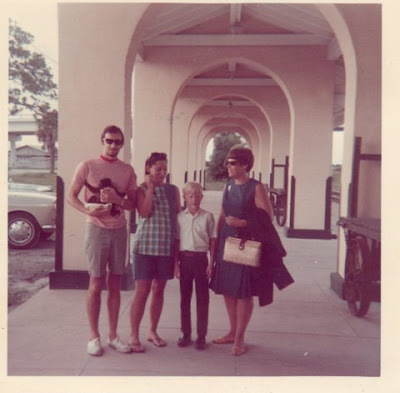 Dad, a monkey, Mom (prego with Tiffany), cousin Bill and Aunt Anne at the Venice Depot in 1968. The Venice Depot in 2009 - now part of the Heritage Trail for bikers and hikers. 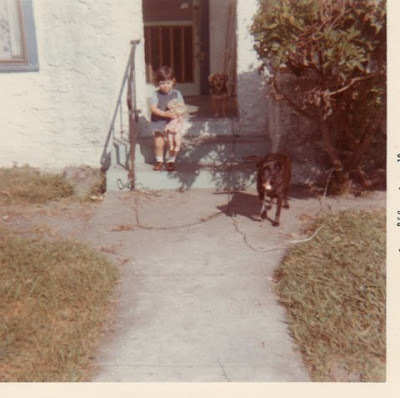 Tiffany at our old Groveland Avenue house in Venice. 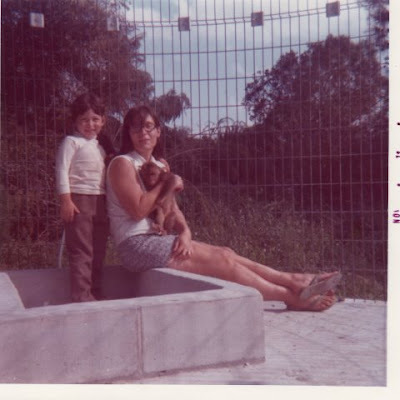 I was an infant - I don't remember those dogs. Amazing that there are still some classic old houses that they haven't torn down to make way for cookie cutter homes. 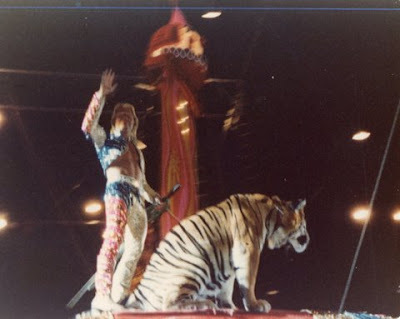 Gunther Gebel-Williams - was considered one of the greatest animal trainers of all time and perfromed for the Ringling Bros. and Barnum & Bailey® Circus in the The Greatest Show On Earth®. He was Venice's favorite son and a world class entertainer. Regardless of my opinions of circuses today, as children we found his show entertaining. He was probably the first person I understood to be "famous" and our parents knew him! He passed away a few years ago and is memorialized below in an appropriately flamboyant statue with a surprisingly defined cod piece. He was inducted into the International Circus Hall of Fame in 1999. And the last picture is for Jack and Josie who think "monkey diapers" are funny. And really who doesn't? 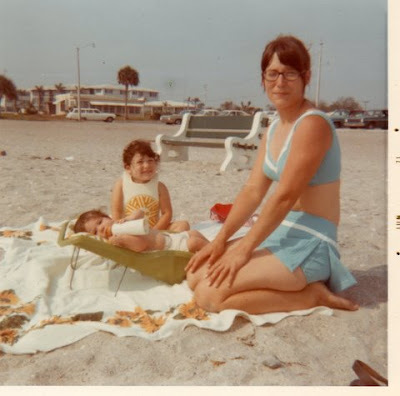 Here's a picture of me in 1971 - in a diaper on Venice Beach. Had I known Tiffany had this picture I would have posed for a picture with me in a diaper on Venice Beach in 2009. EDITED (3/4/2009) - Malena suggested I post this picture of me in a diaper from 2007. I am the SMURF on the left. Baby New Year in the middle and Ashley Hayes Traut on the far right. Remember that scene from Vacation…"Clark, don’t you want to see the Grand Canyon?" Well, this is the Berish Family vacation. In two days we drove across the Everglades to Pete, toured the hometown of Venice, walked down memory lane in Ft. Myers, had an awesome airboat ride on Lake Trafford, drove back across the Everglades, and took a 3 mile hike through the Green Cay Wetlands. We came we saw. We geocached. We had fun. I grew up in Florida and in the 21 years since I met my husband, he has never been to my hometown (by the way, we live in his hometown up in Massachusetts). 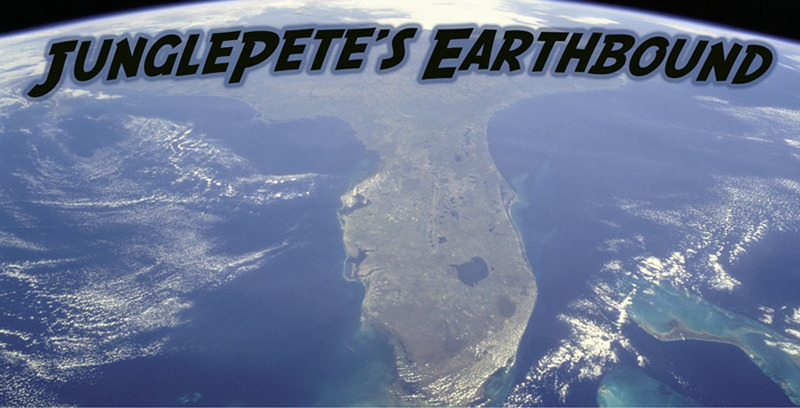 So, with two kids in tow, we drove across Alligator Alley to meet up with Pete and MaLe to go see what has changed in Venice in the last 21 years. A LOT! We visited where we grew up. Even though the house was no longer there, it was surreal to walk around the area. 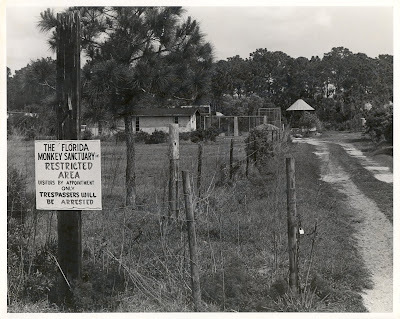 The entrance to the Florida Monkey Sanctuary 35 or so years ago. 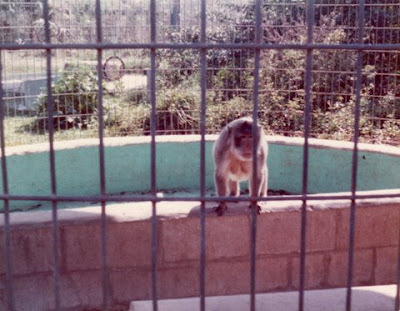 The cone-topped building was a "corn crib" and 10 of these structures housed dozens of monkeys. The one building remaining is "the monkey building" where monkey chow and other supplies were kept. What remains of the cage 35 years later. Abigail posing at the edge of the pool in 2009. 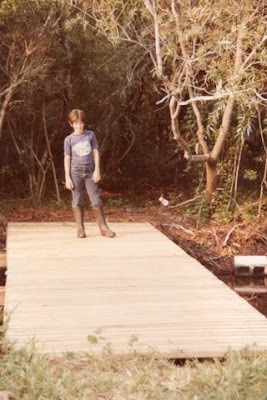 Jungle Pete in 1983 after the completion of the bridge to "the island". The bridge was built by my father, Zak Kelly and myself. The island seemed massive and we would spend hours exploring it as kids. The bridge remains, with railings, but Abigail discovered that one person at a time is possibly one too many. Walking around it might make sense. Most of the vegetation has been removed and the island looks much smaller. More of Tiffany's flashback photos tomorrow.